are low growing evergreen plants that grow 1 ft. tall with a 3-4 ft. spread. will cover themselves with 1"-1½", bright yellow Daisy flowers. near the seaside or under extremely dry conditions. as a ground cover, border plant, or in your rock gardens. Except in area with extremely hot summers, provide them with afternoon shade. Plant Beach Daisies 2-4 feet apart in light, sandy, well draining soil. Keep the soil moist during the first growing season. 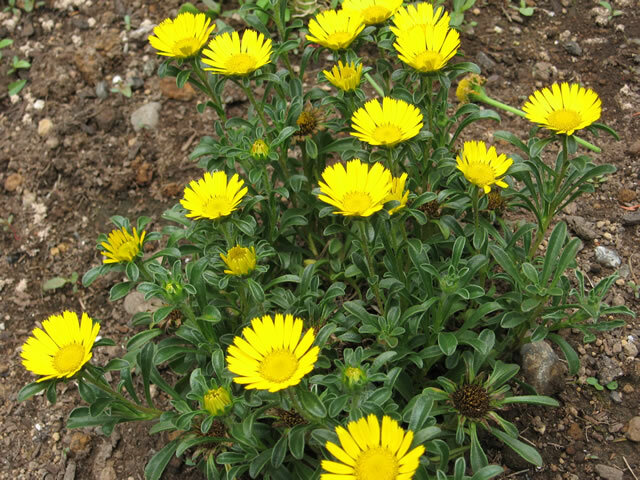 Once established, Asteriscus are very drought tolerant plants. They may go dormant in the late summer dry season if they haven't received supplemental watering, but will perk back up with the fall rains. Feed once in the spring just as new growth begins, using an balanced, all purpose fertilizer following the directions on the label. taken at any time of the year. Layering is another way of propagating Beach Daisies. Pin the tip of one of the woody branches to the ground, and wait for it to root. Sow African Daisy seeds directly into the garden in the spring, after all danger of frost has passed.